OTTAWA, Ontario, August 15, 2017 – Power system design engineers want to be fast, accurate and confident with their simulated designs prior to building hardware. Achieving these goals with GaN designs has become easier with GaN Systems’ new set of LTSpice models. Increasing efficiency and power density requires proper layout and understanding of the characteristics of these fast transistors. GaN Systems provides a full-featured set of LTSpice simulation files that are available now for download that allow for a variety of inputs and simulations options; select the product of interest and then select the LTSpice button. Additionally, LTSpice application notes GN007 and GN008 are available on the GaN Systems website. Level 1: Basic adjustment and analysis of switching speeds, optimized for quick simulation. Level 2: In addition to Level 1 features, includes thermal inputs and Cauer thermal RC network transient models for simulating the device junction temperature and self-heating effect. Level 3: In addition to Level 2 features, includes parasitic losses, provides the most accurate model with longest simulation times. 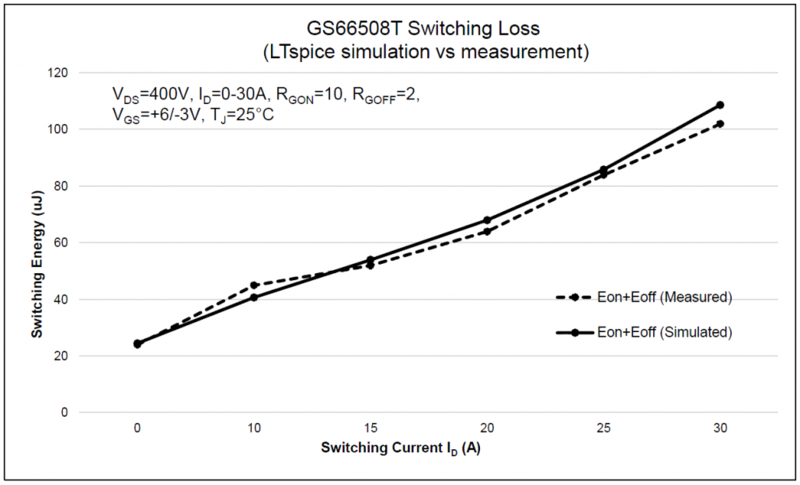 To confirm the accuracy of the LTSpice model, laboratory measurements of GaN E-HEMT switching losses were recorded using a half-bridge, double-pulse test circuit. 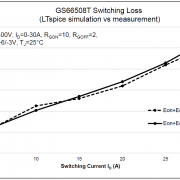 The switching losses measured in the test were then compared with the LTSpice model simulations. The comparison demonstrates a strong correlation between the simulated results and real-time circuit measurements. With a 400 V, 0 to 30 A switching current setup using a 650 V, 50 milliohm GS65008T device, the difference between actual measurement and the simulated model is less than 5%, a very good number for Eon/Eoff accuracy. The outcome is a simulation tool that provides a convenient and accurate way to understand GaN switching characteristics, evaluate GaN switching performance under different electrical conditions and build overall confidence in a new product design.